We always love stocking our shelves with great goods for the gents in our lives. Buttery leather goods, needlepoint accessories and cool chattles that liven up their offices are just a few things you'll find in store for all your "Dad, I love and appreciate you" needs. Swing into #thenoke to pick up a gift and a card for dear old dad that's as unique and cool as he is! New Swell styles have arrived, just in time for summer picnics, adventures and parties al fresco! We adore all our Swell bottles, due to their ability to keep hot things hot for 12 hours, cold things cold for 24 hours, and all while remaining comfortable to the touch, thanks to triple walled construction. In addition to the classic style and sizes, the company continuously introduces new models, like tumblers and travelers, as well as corresponding accessories. The latest launch is the Roamer, in 40 oz and 64 oz options. Meant for holding sharable liquids (we're thinking of our favorite IPA right now), this style is an elegant take on the growler, and pairs perfectly with the small tumblers. The Roamer also has a handle that can be clipped to backpacks, kayaks, bikes and the like, with the carabiner of your choice, making it a handy addition to every outdoor excursion. Sip by Swell offers a more casual, cheerful take on the company's more classic bottle styles, letting personalities shine through with wide array of playful prints and bold color options. 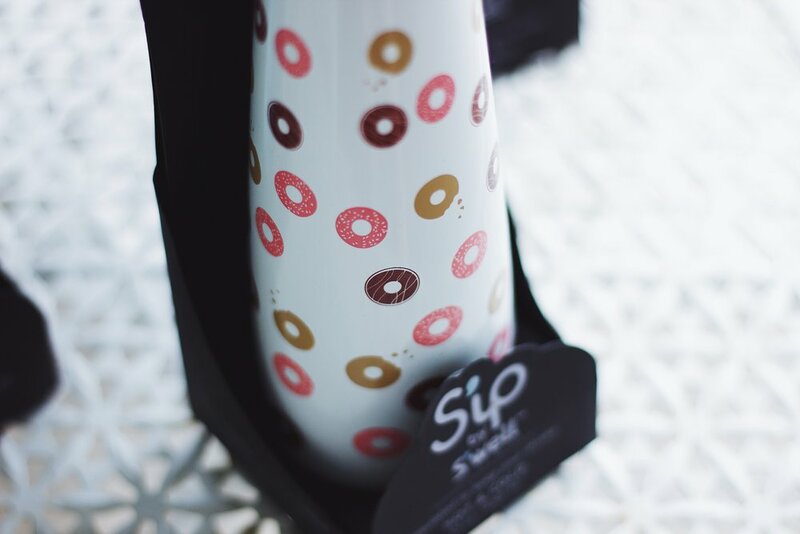 The Sip bottles hold 15 oz, hot and cold, are double-walled, and feature leak-proof cap. We're particularly smitten with the adorable donut print style the company calls Frosted, because, well, donuts. Start prepping for summer and shop all our Swell styles. They make for great grad and dad gifts, as well! We love giving gorgeous little gifts for the holidays, especially when said gifts are made by Indiana based artisans and makers. Enter Amber Blends, one of our fav-o-rite fragrance lines, that just so happens to be made just south of us in Indianapolis. The range of unisex fragrances is unique and luxurious and features natural ingredients. The scents are sultry and warm, and as they mix with the wearer's unique chemistry, they deepen for a customized finish. We know women who've lost their bottles to their husbands and vice versa, so we're confident these fragrances are gifts anyone will enjoy. Our sister store, The FIND, caught up with the owners of Ambre Blends to chat about the history of the company, current products and what we'll be wearing from them next year. Read the blog post then come shop the comprehensive line of fragrances and bath & body products for those on your gift list - or for yourself (we won't tell). We dream of the Winter holidays all year long. We shop, plan and curate the best of the best stocking stuffers and gifts in the land, for every kind of recipient. Of course, it would be impossible to share all the goodies we have in store, so we've handpicked some of our current favorites. From tiny treasures to thoughtful luxuries, we're excited to help you stuff your stockings with style! We're on standby here in #thenoke to serve as your elves this holiday season! to be filled with unique and delightful pieces that will bring joy to faces everywhere! With stylish totes and leather goods, fun and funky jewelry (have you seen the cement jewelry yet? We're obsessed. ), cute books for children and the perfect card for the wine lovers on your list, there's so many treasures at The Trove. Get a head start on your holiday shopping now, so you can really enjoy the festivities of the season ahead! Spoil daddy dearest rotten this year with interesting and unique versions of the standards. We love shopping for the guys so our men's department is always well-stocked with books, home goods, neckwear, personal accessories and even some cool tools. From the perfect cocktail hour to grilling in style, here are a few of our picks for Father's Day 2017. We Trovesters appreciate a well-appointed cocktail hour so we line our shelves with tons of appropriate accessories in store. Izola consistently provides elegant goods, like a gorgeous matte gold flask that mom will envy to chic, unbreakable (!!!) glasses for dad's favorite concoction. Take Pop's grilling game to the next level with light up tools so he can fire up the coals any time. Package these slick beauties with a tasty new hot sauce recipe (+ all the necessary ingredients) for a fun gift you can enjoy together. We're quite partial to this Habanero Peach Hot Sauce recipe, courtesy of The Peach Truck. *Did you happen to catch them as they rolled into Northeast Indiana? If not, hop on their mailing list so you don't miss out next year. Come to #thenoke to shop our full selection or take a peek at our curated list online. See something you like and want to nab it right away? We offer a local pickup option. Let us know how we can help you pull off your best Father's Day gift yet! 75% of us Trovesters are moms and 100% of us have one, so we feel like we've got a lock on what moms of all ages and interests would like for Mother's Day - in addition to your undying love, of course. Some moms adore sparkling jewels and gorgeous fragrances, while others dig a super soft, flattering tee or a kickass tech accessory. Take a peek at some of our picks, click through our online shop and come take a few laps in store to pick out the most perfect gift for the magnificent moms you love! Graduation from high school and college is a magical time. Full of hope and promise, and a little bit of trepidation (most likely) this transitional time is made better by supportive friends and family. While doling out wisdom, advice and tales of your own experiences, hand over a cool token to commemorate the happy occasion. Peep these popular, functional and stylish options below, handpicked to reflect the schools your grad may be leaving or headed towards, for extra thoughtfulness points. As always, there's a ton more in store and we're happy to help you find the most unique gift for your special grads.